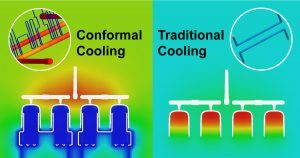 Cooling is the longest portion of the injection molding cycle. A reduction in the cooling time can help achieve significant savings. This webinar will focus on Moldex3D’s cooling simulation capabilities. Attendees will learn how to use Moldex3D to predict potential molding problems such as hot spots, shrinkage, warping, residual stress, etc., and how to evaluate the effectiveness of different cooling channel designs. Join this webinar to see how Moldex3D Cooling Simulation can help you meet cycle time, part quality and lead time requirements.